There’s something magical about fall: the changing of warm temperatures to a fresh, crispness in the air. As a Style Coach, I thrive on nature’s beauty and all of the new hues it brings when creating outfits for clients and for myself. It truly is a time to be inspired! Because of the nature of my work, I often find myself needing casual yet polished outfits. I appreciate the simplicity of this type of outfit while it’s actually not always the easiest task to master. 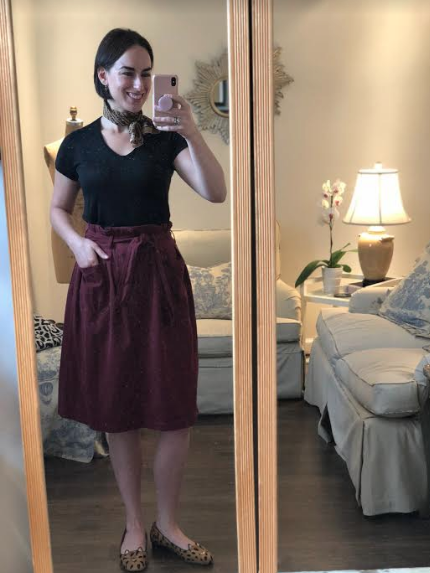 However, once you understand the art of outfit formulas, your body type and personal style, you’ll soon find that getting dressed no matter the season of the year is fun! But I especially love the layers and colors that fall brings to my wardrobe. 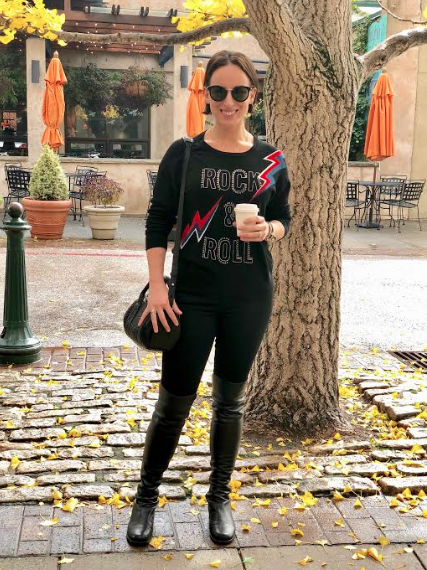 Here are my personal outfits and style tips that I often share with my style clients. It’s time to get inspired! Style Tip #1: A cozy knit dress in a thicker material is a go-to! It’s not clingy but still has some shape to it making it both flattering and comfortable. 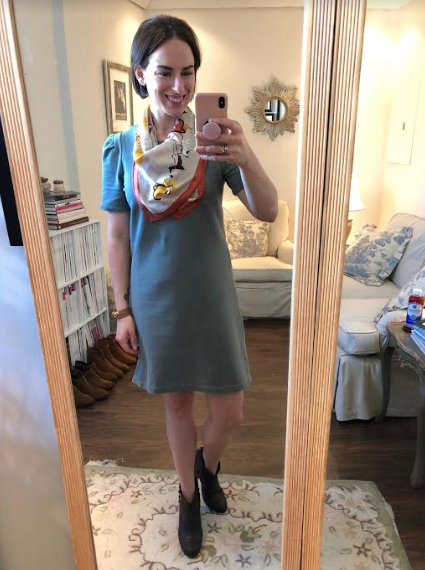 To jazz up the dress and keep it from feeling boring or one note always add a ‘third piece’ which in this case is a vintage silk scarf that I’ve folded in half to make a necklace-like effect. And lastly by selecting a dip down in the front bootie you are elongating the legs instead of chopping up your visual vertical line. Style Tip #2: Another way to rock a vintage silk scarf is to tie it around your neck in a very French girl way. With the scarf having a subtle print to it the rest of the outfit is solid except for a print pop in the shoes. The reason the 2 prints work together and don’t compete is the color palette. They are both black-tan and relate to one another, especially when the rest of the outfit is neutral. This outfit is perfect for a fall day when the weather isn’t too cold as the colors look fallish but there aren’t too many layers. Style Tip #3: Graphic sweaters are a big trend this season and are a fun way to jazz up basic jeans + basic sweater. Select a graphic print or saying that best reflects your personal style–for me I am a music junkie so this one spoke to me. I kept the look comfy yet sleek with black high waisted jeans and black over the knee flat boots. When wearing a long sleeve sweater or top, if possible, always push or roll up the sleeves for a more flattering look. Style Tip #4: Another big trend this season is the fun, feminine color combo of fuchsia + burgundy. I personally adore both of these hues so it’s a trend for me to wear this season. 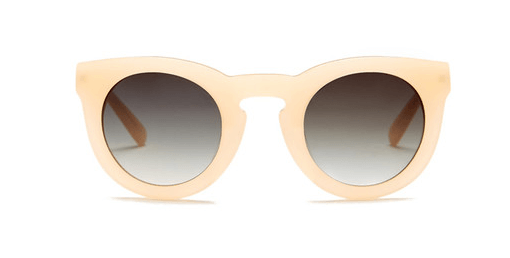 To wear color in a tonal way that doesn’t overpower you try to have one of the bolder colors in an accessory. 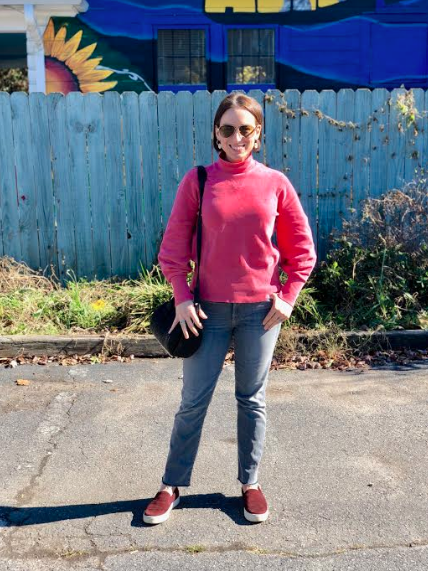 By pairing my pink sweater with gray jeans and a burgundy sneaker I get the fun color combo without being too bold. Also know that gray + pink are friends and look good together in any form. Style Tip #5: While jeans are my favorite, it’s nice to switch it up sometimes with something equally comfy but different in form. 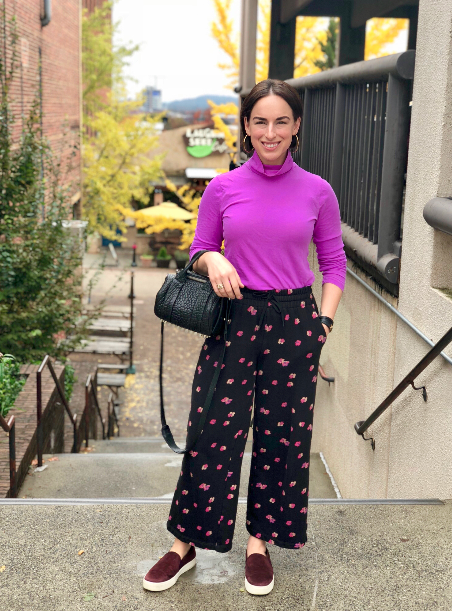 That’s where these fun sweatshirt material, floral print culottes come in handy. To take them into fall I’ve paired them back with a pink tissue turtleneck and burgundy suede sneakers. To avoid looking too ‘matchy matchy’ try pulling out the more subtle colors in a printed garment and using those colors in the other items that you are wearing. From there keep the rest of the look simple to avoid looking overdone. Do you need certain items in your wardrobe to complete your fall/winter looks? Don’t know where to start? Grab my Fall/Winter Shopping List by clicking the image below. 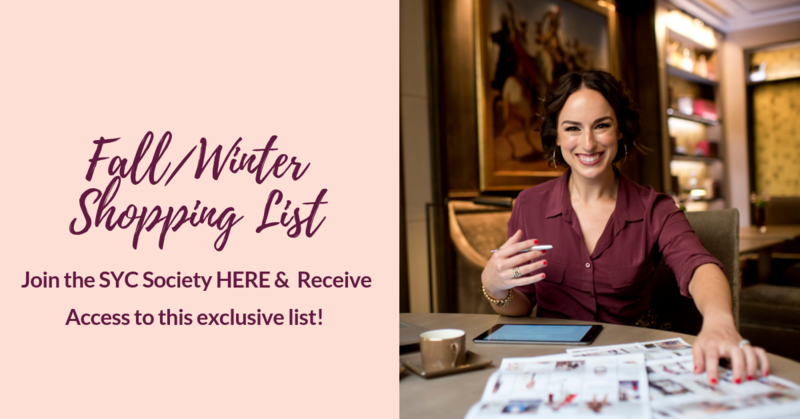 This exclusive guide provides an extensive list of basics and trend driven pieces that you’ll need all season long to create outfits with ease!